Fighting in North and South Kivu provinces in the DRC has led to massive displacement, forcing tens of thousands of people to flee their homes. The Security Council today strongly condemned the recent mutiny by renegade soldiers in the Democratic Republic of the Congo (DRC), as well as the killing and abuse of civilians, mostly women and children, by armed groups operating in the eastern part of the country. The eastern provinces of North and South Kivu have witnessed increased fighting between government troops and renegade fighters following the mutiny by soldiers led by Bosco Ntaganda and Sultani Makenga in April. The fighting has displaced more than 100,000 people, including many who have fled to neighbouring Rwanda and Uganda. “The Members of the Security Council expressed strong concern about the recent developments in the Kivus and the deterioration of the security and humanitarian situation resulting in significant flows of displaced persons and refugees,” the 15-member body said in press statement. They strongly condemned the mutiny of officers and soldiers, formerly integrated into the DRC armed forces (known by the French acronym FARDC) and now operating in North Kivu as an armed group under the name M23. They called on all countries in the region to actively cooperate with the Congolese authorities in demobilizing the M23 and all other armed groups, and preventing them from receiving outside support in contravention of the Council’s sanctions regime. They also called for a full investigation of credible reports of outside support to the armed groups. In addition, the Council strongly condemned the killing and abuse of civilians, mostly women and children, by armed groups, including the Democratic Forces for the Liberation of Rwanda (known by the French acronym FDLR), as well as all acts of sexual violence, calling for perpetrators to be brought to justice. Earlier this week, the Secretary-General’s Special Representative and head of MONUSCO, Roger Meece, told the Council that it is vital to put an end to the armed mutiny, which has led to a worsening of the security situation and a major displacement of civilians. “The people of eastern Congo have already suffered too much and for too long, and any actions that prolong violence and armed conflict in the region must stop,” he said. 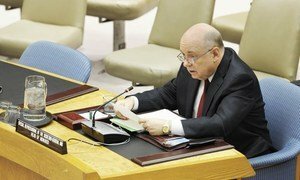 It is vital to put an end to the armed mutiny that began in April in the eastern Democratic Republic of the Congo (DRC) which has led to a worsening of the security situation and a major displacement of civilians, a senior United Nations official told the Security Council today.